Indigenous communities from South American countries advocated the preservation of rivers and mountains and criticized efforts to privatize and trade water springs and aquifers. They spoke at the 8th World Water Forum, during a special session coordinated by the United Nations Education, Science and Culture Organization (UNESCO). For several communities taking part in a session dubbed Water Culture of Indigenous Peoples of Latin American, water is seen as sacred and part of the family—something to be preserved for future generations. 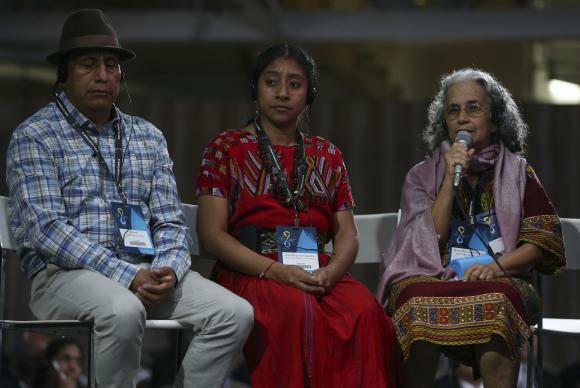 Brazilian Maria Alice Campos Freire, of the International Council of the 13 Indigenous Grandmothers, explained that the indigenous people of the Amazon have always nourished respectful ties with water, which have passed from generation to generation since their remotest ancestors. In traditional education, water is revered, she says, even before consumption is considered. While answering questions posed by the audience, Freire noted that the Alternative World Water Forum—also being held in Brazil’s capital city—is putting together a dossier with the stories of indigenous territories and “shrines of nature” under threat by a number of sectors of industry. As an example, she mentioned the Évare I and II indigenous territories, high by the Solimões river, in the Brazilian Amazon, where indigenous people are said to be murdered, and women raped. Subsecretary for Hydrographic Demarcation of Ecuador Luís Olmedo Iza Quinatoa noted that Ecuadorians achieved “a historic deed, namely the acceptance of the existence of indigenous peoples by society,” as a result of the occupation and demarcation of a territory with water springs in it. Quinatora mentioned that the first minister in the country’s history took office last year, after a number of fights and legal strides, which also brought about indigenous communities’ financial and administrative autonomy for the management of water resources. “We are connected beings. For us, water is a divine, living being, meant for community use, and therefore something to be shared. We do not understand how water should be sold. We’ve always protected it and insisted that our natural resources are not destroyed. When the private enterprise starts destroying these ecosystems, we’re left incapable of collecting water,” he argued. Freya Antimilla, a representative from the Mapuche people of Chile, argued that the answers to the recent lack of balance in nature, especially when it comes to water, are to be found among the native population. “Water scarcity and everything we’re facing more and more severely stem from this lack of balance: [resources] are only ever taken away, with no importance given to biodiversity, which is left aside,” she said.